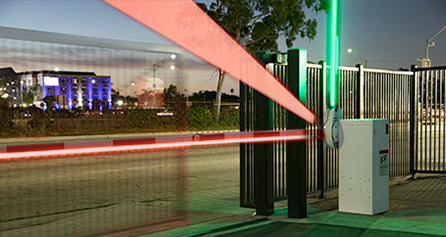 DoorKing (DKS) offers a full line of barrier gate operators, traffic spikes (automated and stand-alone), warning signs and more. 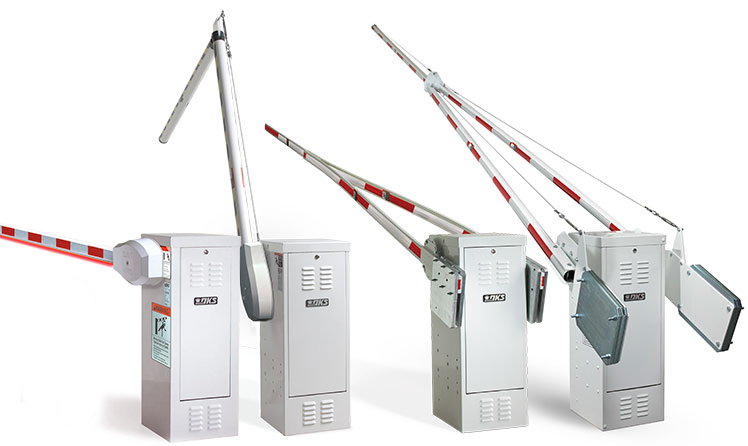 Our barrier operators are designed with advanced electronics for the parking industry – multiple UP commands, UP input memory buffers, down memory options, plug-in loop detectors, several barrier arm options, the DKS Loop Logic (PatPend) vehicular/pedestrian detection system, LED lighted barrier arms, and breakaway hardware kit. We also back our barrier operators with a 5 year warranty. In those rare instances when you may need service, DKS has a nationwide distributor and dealer network over 3000 strong – and you won’t have to wait for parts to arrive from overseas to put your system back into operation! 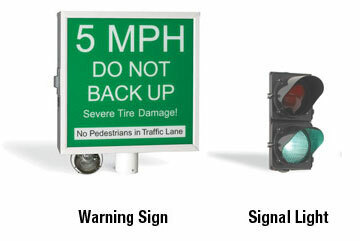 Designed for single lane (14 ft. max) vehicular traffic control in high traffic commercial and industrial applications. The 1601 operator is designed so that it can be mounted on either the left or right hand side of the roadway. The operator can be equipped with a DC convenience open package (optional) that will automatically raise the arm in the event of a power outage. • 1/2 HP continuous-duty motor. • 40:1 gear-box running in a continuous oil bath. • Arm rotates 90° in approximately 1.5 seconds. Designed for traffic lanes up to 27-feet wide in low use commercial and industrial applications. This operator uses a counter-balanced three-piece wishbone style arm assembly. The 1602 operator is designed so that it can be mounted on either the left or right hand side of the roadway. The operator can be equipped with a DC convenience open package (optional) that will automatically raise the arm in the event of a power outage. • 1 HP continuous-duty motor. • 60:1 gear-box running in a continuous oil bath. • Arm rotates 90° in approximately 5.5 seconds. Lighted arms are a great way to enhance safety and increase visibility in barrier arm applications. The energy efficient LED lamps are recessed behind the red/white warning tape on the DKS round aluminum barrier arms. These LED lighted arms are available for use with the DKS 1601 or 1603 barrier gate operators. •	Enhanced safety and increased visibility. •	Energy efficient LED lamps. •	Integrated into the DKS 14 ft (4.27m) round aluminum barrier arm. 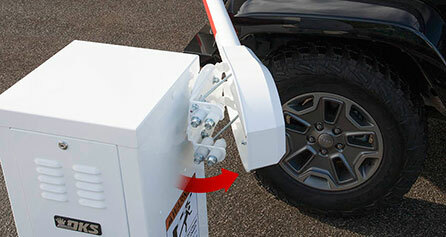 DoorKing’s breakaway hardware kit for Model 1601 Barrier Gate operators prevents costly arm replacements by allowing the arm to swing out of the way in the event that a vehicle fails to stop at a lowered arm. If the arm is struck and breaks away, the gate operator automatically shuts down. The system is easily reset by simply snapping the arm back into place. The breakaway kit is designed for aluminum arms only and can be setup to breakaway from either side of the cabinet. •	Allows arm to swing out of the way when struck by a vehicle. •	Easily reset by simply snapping the arm back into place. 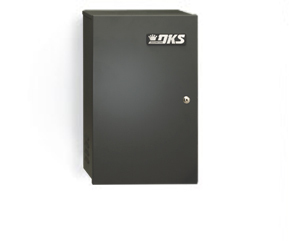 The DKS 1603 Barrier Gate Operator / Automated Spike System is designed as a modular system allowing for easy flexibility in different applications and easy installation. The 1603 operator is designed with many advanced features and mechanically links the spikes to the barrier arm. Ideal for parking lots, rental car agencies, schools, car dealerships, government agencies, or in any application where a higher degree of traffic control is preferred. DKS barrier operators now offer the DKS Loop Logic (PatPend) vehicular/pedestrian detection system that knows when to allow the barrier arm to come down – or not. 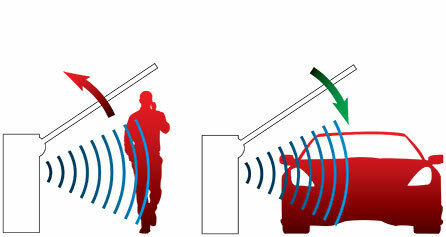 The system reverses barrier arm if person is detected, and lowers barrier arm if unauthorized vehicle enters. This allows the protection of parking facilities to help prevent inadvertent accidents from happening. Warning signs and traffic signals are used with traffic control spikes and auto-spikes to inform drivers that a one way lane condition exist and that proceeding in the wrong direction, or before the spikes are fully retracted, will result in severe tire damage. Warning signs and/or traffic signals should always be used in any traffic control application utilizing traffic control spikes. DoorKing's Power Inverter and Backup systems are designed to provide backup power for your vehicular gate and access control system when primary (AC) power fails. These systems convert DC battery power to AC power to keep your system operable at all times. The Model 1000 is designed for a single gate and access control system. 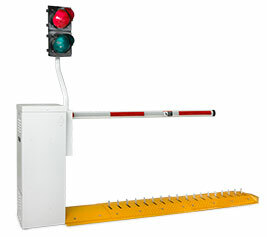 Traffic control spikes are ideal for controlling traffic direction and speed through a controlled entry location. Traffic spikes prevent vehicles from proceeding through a traffic lane in the wrong direction by enforcing one-way traffic lanes. Speed bumps force drivers to slow down while driving through the controlled entry point. They are also ideal for keeping vehicular traffic at a safe speed while driving over traffic spikes.